With returns likely to be lower in future than they were in the past, investors may need to re-set their expectations or accept higher risks, says Emma Stevenson, Investment Writer at Schroders. The Global Investor Study carried out by Schroders in 2017 found that investors’ expectations of returns are high. More than a third were looking for a return of 5-9% per annum, over the next five years, while 31% expected 10-19%. Those investors looking for income have similarly high targets, with our 2016 study finding that 41% of investors were looking for income of at least 8% a year. With interest rates still at low levels ten years after the global financial crisis, it may seem surprising that investors have not adjusted their expectations downwards. If anything, the opposite has happened, with our study finding that milliennials have the most optimistic return expectations of any age group. However, a typical trait of human beings is that we take the experience of the past and extrapolate it into the future. That is, we largely expect the future to be much the same as the recent past. And, when it comes to investing, the recent past was an era of high returns. The chart below shows annualised real returns (i.e. 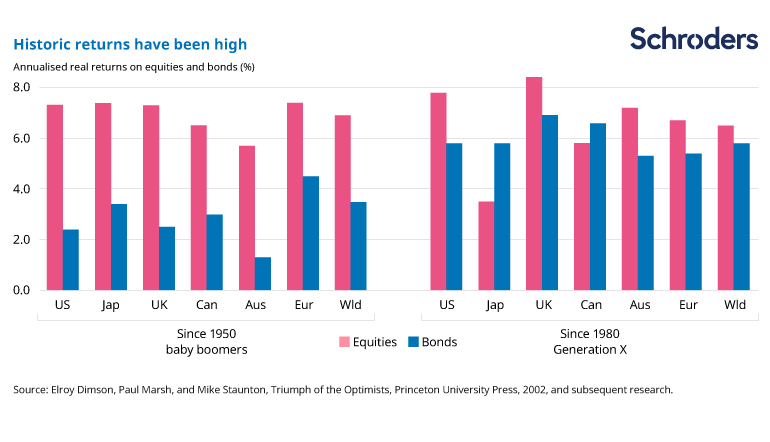 adjusted for inflation) for both equities and bonds, as experienced by the baby boomer generation (those born between 1946 and 1964) and Generation X (1964-1980). The point about real returns is an important one here, given high inflation was experienced during the period, particularly in the late 1970s and early 1980s. The charts show equity returns have been fairly high across every region, and bond returns particularly strong since 1980. However, most forecasts suggest that future returns will be well below these levels. There are several reasons for this. Firstly, inflation is expected to remain low, albeit rising from recent ultra-subdued levels. Low inflation means a smaller yield premium is demanded by bond investors to compensate for the erosion of buying power inflicted by inflation. Secondly, low inflation also implies low interest rates. Although on the rise from crisis levels, interest rates are widely expected to remain fairly low because global economic growth is forecast to be slower in future than in the post-World War Two era. Again this is due to numerous factors, including moderating expansion in some emerging economies, and demographic changes such as a slowdown in the growth of the working age population. As a result of these and other factors, returns are expected to be lower in the future. 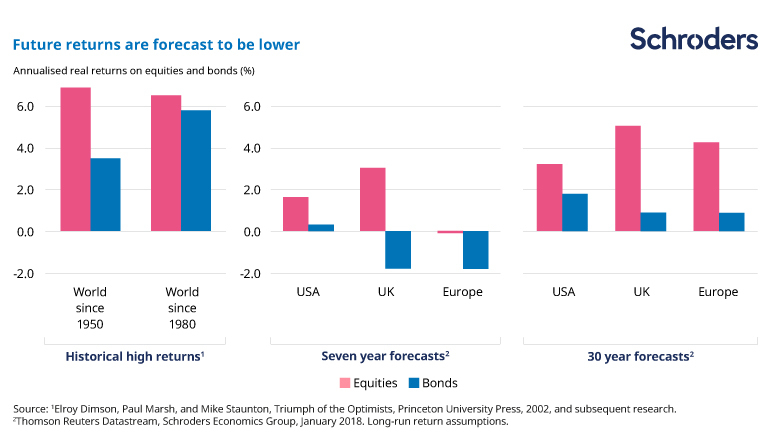 The chart below compares the high historic returns with the latest long-run returns predicted by the Schroders Economics Group. These indicate that the 6%-plus equity market returns enjoyed in the recent past are not expected to be reached in the US, UK or Europe. It is an even starker picture for bonds, with negative real returns expected in the UK and Europe on a seven-year view. Not shown on the chart, Schroders Economics Group forecasts Asian equities to outperform most developed equity markets on a 30-year horizon, as a consequence of differences in productivity growth. Even here though, real returns are forecast at 5.4% for the Pacific (excluding Japan) region and 5.9% for emerging markets. What does this mean for investors? With interest rates looking set to stay low, cash savings will be eroded by inflation. Investors seeking higher returns may need to save more and/or broaden the asset classes they invest in. This brings other risks, for example investors in higher-dividend paying equities will need to be mindful of the price they pay for those stocks. Credit (corporate debt) is another option but higher-yielding issuers often carry higher risk of default. Income-seekers may need to invest over longer timeframes, and keep currency risk in mind if they invest outside their home region. As a result, investors looking for higher returns and income may need to turn to asset managers for help in achieving their aims while mitigating these risks. The forecasts included should not be relied upon, are not guaranteed and are provided only as at the date of issue. Our forecasts are based on our own assumptions which may change. We accept no responsibility for any errors of fact or opinion and assume no obligation to provide you with any changes to our assumptions or forecasts. Forecasts and assumptions may be affected by external economic or other factors.